In cell biology and biology in general, cytochemistry is the study of the (bio-chemical) chemical constituents of the cell. Using cytochemistry, it has also become possible for scientists and technicians to localize various chemical components or elements, which may be enzymatic or non-enzymatic in nature. A number of techniques are used for the purposes of localizing these chemical components (of both the cells and organelles) as well as their transformation in relation to the functioning of the cells of interest. This technique is used for the purposes of detecting a ligand bond to a given target site or cell. For this technique, molecules with a high affinity for each other are used. As such, it have proved to be an important technique for detecting neuropeptides (group of compounds that act as neurotransmitters - these are typically short-chain polypeptides). In affinity cytochemistry, one of the most common methods is the streptavidin system (Biotin-Avidin system). Avidin (the egg white derived glycoprotein) has a high affinity for Biotin. The Biotin molecules can be attached/ coupled to a protein, which would allow the protein (biotinylated protein) to be able to bind to more than one molecule of avidin. This makes it possible to visualize any proteins that may be present in low amounts. That is, the ability to visualize proteins that are in low amounts is enhanced. This method can also be used together with microscopy. Here, avidin is covalently linked with electron microscope markers allowing the Biotin-Avidin system to be used for the purposes of studying a wide range of biological structures and processes. This is a staining technique that is based on enzymatic detection of antigen - antibody complex using a biotin labeled secondary antibody and subsequent signal amplification using the biotin-peroxidase and strepavidin complex. In this method, the visualization of the antigen is made possible by the reaction between the peroxidase and diaminobenzine which forms a brown precipitate at the site of the PR protein (pathogenesis-related). In situ hybridization is a technique that is used for the localization and detecting of specific mRNA sequences in tissues that have been morphologically preserved or in cell preparations. This is achieved by the hybridization of the complementary strand of a nucleotide probe to the sequence of interest. This technique works using the same principle as normal hybridization process. In this case, there is isolation of DNA/RNA, separating it in gel, blotting it on to the nitrocellulose and finally probing it with a complementary sequence. With in situ hybridization, the only exception is that a probe is used for the purposes of detecting the specific nucleotide sequences within the cells or tissue of interest. This being a sensitive technique, the threshold levels of detection range between 20 and 50 copies of mRNA per cell. This method has often been used to indicate the localization of gene expression in their respective environments. Here, the labeled RNA or a DNA probe is used to hybridize a given target mRNA/DNA sequence within the sample of interest. It becomes possible for the RNA or DNA probe to be detected using an antibody that can detect the label of the probe. One of the problems that is likely to be experienced with this technique is with regards to the sequence to be detected. Here the sequence tends to be at a lower concentration. It may also be masked because of associated protein or protected within the cell/cellular structure. Oligonucleotide probes - They are synthetically produced through an automated chemical synthesis process. They have a number of advantages including being resistant to RNases in addition to the fact that they are small (40 to 50 base-pairs) which makes it easier during penetration into the cell or tissue of interest. Lastly, they are single stranded which is a big advantage in that the possibility of renaturation is greatly minimized. Single stranded DNA probes - Despite being larger (200 to 500 bp) these probes have advantages similar to Oligonucleotide probes. Double stranded DNA probes - This probe is produced by including the sequence of interest in bacteria. This is then replicated and lysed with the DNA being extracted and purified. Lastly, the sequence of interest is excised with a restriction enzyme. RNA probes - These probes have been shown to be very thermostable and resistant to digestion by RNases which are some of its advantages. Also referred to as immunogold staining, this is a technique that is commonly used in electron microscopy as a staining technique. As such, it is often used for identification, localization as well as the distribution of proteins, antigens and a number of other macromolecules. Although it is more similar to the conventional immunofluorescence techniques used in microscopy, this technique provides an added dimension compared to the fluorescence assays given that it makes it possible to clearly observe the localization and distribution of macromolecules at ultrastructural level and at high magnifications and high resolution. This technique is largely used for detecting proteins, antigens as well as various other macromolecules. In particular, it is used for detecting these molecules when they are located on the surface of the cell or any other biological specimen. On the other hand, it has proved to be an important technique for other specimen that may be ultra-thin sectioned. Here, it is largely used to examine the exterior and interior of such specimen. Post-Embedding Labeling is the technique that is only used to detect proteins, antigens and various other macromolecules located in the interior regions of the specimen of interest. Negative Stain Immunogold Labeling Technique - This technique is used for the purposes of detecting proteins, antigens or other macromolecules that may be on the surface or the interior of biological specimen. Immunogold labeling is a powerful technique, making it one of the few or only techniques that can be used to probe cells untrastructurally. This is largely due to the fact that the process is devised to attach gold probes to secondary antibodies and consequently to primary antibody that help reveal the presence of antigen. It is relatively easy to carry out. It is particularly suitable for real-time monitoring of the ultrastructure and antigens. It can help improve assessment of target markets on cellular microenvironment. It provides good intratechnique comparison and reassessment as well as crucial information for histochemical analysis. Basically, the process involves a reaction between the enzyme being used and the substrate to produce a given color. With regards to cytochemical stains, there are both enzymatic and non-enzymatic stains. This is an enzyme that is located in the granules of both the myeloid and monocytic cells. As a stain, it is positive in cells of granulocyte series. Its activity increases with the maturation of myeloid cells while the immature myeloid cells tend to have very little to no staining. This stain works by splitting the hydrogen peroxide in the presence of chromogenic electoron donor, which results in the formation of an insoluble product. This enzyme (e.g. alpha naphthyl acetate esterase) is mostly found in monocytic cells in large amounts. In myeloid and lymphoid cells, it is present in little amounts. It is typically used for the purposes of identifying monocytes. As a result, lymphocytes will often stain focally while the myeloid cells stain very weakly. This type of stain is largely used for the purposes of diagnosing acute myelogenous leukemia with monocytic differentiation. This stain is mostly used for the purposes of demonstrating glycogen and related mucopolysaccharides. When used for Myeloid or monocytic blasts, the outcome is often weakly positive or negative. However, it is positive in erythroid population in erythroblastic leukemias. This is a lipophilic dye that is typically used for the purposes of staining intracellular phospholipids and other lipids. It functions by irreversibly binding to an unidentified granule in granulocytes or eosiphils. S. Fruehauf, A. Pitkus, J. Dengler, S. Kraeker (2006) Cytochemical staining. Meir Wilchek, Bayer A. Edward and Ehud Skutelsky (1990) Affinity cytochemistry. 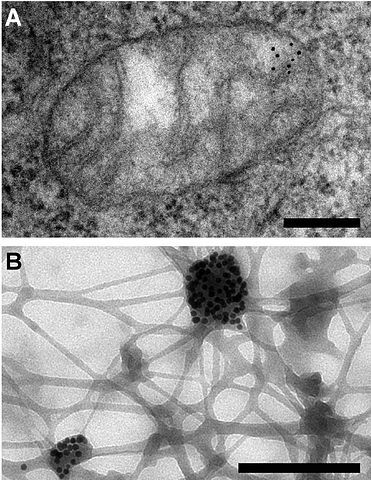 Mogana Das Murtey (2016) Immunogold Techniques in Electron Microscopy.